Now to be blunt with you all, my belief is that every single person can benefit from therapy of some sort at every point in their life. Sometimes for financial reasons, or for time reasons, or for a lack of competent therapists out there we don’t go to therapy. There is still a stigma around people seeking therapy about being “crazy” or “insane”, but that is simply a hold over from movies like One Flew Over the Cuckoo’s Nest and not reality. In reality, I believe those who seek therapy should be commended and respected. We all have problems, we all have struggles, but those in therapy are actually doing something about it. 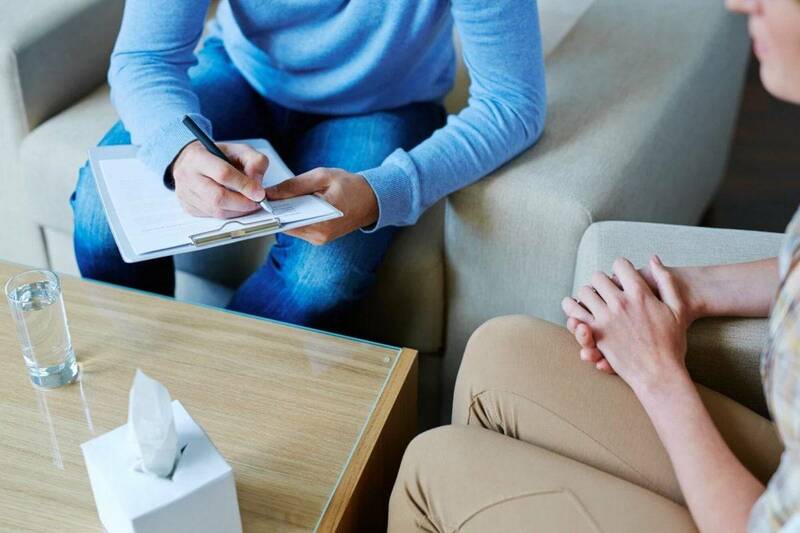 Still, it’s reasonable to ask what are some reasons why you might seek therapy? The same problem keeps happening over and over again. Saint Paul put it better than any psychologist I have ever read in Romans 7:15: “What I do, I do not understand. For I do not do what I want, but I do what I hate.” As a therapist I might ask the question: What thought ran through your head right before you did what you did not want to do? Perhaps it was: “this will be fun”, or “I am uncomfortable, and this will make me feel better”. Whatever it is, therapy–particularly Cognitive Behavioral Therapy–can help us answer the question “why do I do what I don’t want to do” and then to implement changes that can help avoid those behaviors and adopt better ones. Often times when people call me seeking marriage counseling, I get the sense that they are ashamed in seeking help for their marriage. I understand this, particularly in the Catholic Church were we emphasize the importance (and rightly so) of marriage and family harmony. In reality, though, I am overjoyed when couples come to marriage counseling, particularly when they say it is for something “small and unimportant”. Multiple studies have indicated that couples wait 6 years from when signs that there are issues in the marriage. You can imagine my joy when a couple comes in to seek therapy at the onset of an issue. Furthermore, therapists really do want their couple clients to be happy. I don’t want couples to spend years in miserable marriage interactions instead of simply coming in and getting help for a few weeks. Everyone experiences painful things in their life. That is the entire point of the Cross and Resurrection. However sometimes we experience trauma in a way that is particularly wounding. There is a common temptation to think “My trauma is so minor; it’s not like I’ve been to war”, or “it really wasn’t all that bad”. However, one does not need to experience combat in a literal war zone to have lived through painful and difficult experiences that cause lasting effects for more than a few weeks. These might be flashbacks, difficulty sleeping, hypervigilance, or extreme anxiety. The really wonderful news is that advances in the last twenty years have made the treatment of PTSD much much more effective. Whether it is EMDR or CBT for trauma or any number of other techniques, the prognosis in many cases has never been better. Death of Someone Close to you. Grief–not surprisingly– is one of the most painful things that any of us can go through. When I was a grief counselor at a hospice, we would describe the death of a love one as the only trauma we are all guaranteed to experience. The other very frustrating aspect of grief is that it tends to compound. For example, a man may grieve the death of his parents after they die and again later when his spouse dies. This is especially true if grief was not truly processed in the first occurrence. Adding to this is the fact that our culture gives the impression that the bereaved should be “over” the death of someone close to them in a week or two. Actually, the grief process can take years, and we never really “get over” the death of those who are close to us. Grief therapy is about working through those emotions with someone who understands what is going on and learning to manage the process rather than trying to be rid of it. Whether it is anxiety or depression or just simply feeling out of sorts, therapy can help all of us greatly in understanding why we do what we do and feel what we feel. Some therapy might focus on understanding the past and how past experiences will affect the way we see the world, and other forms of therapy focus on a person’s thoughts and why we think what we think. In both cases, therapy can help us to understand ourselves better. Mount Tabor Counseling is able to provide counseling at any one of our four locations and online throughout the whole of Colorado. If we can be helpful please feel free to make an appointment. For those who might be outside of Colorado, there is the website catholictherapists.com which will allow you to find a therapist near your location. And please remember, going to therapy is a sign of strength, not weakness, and it never hurts to call and just ask if you might benefit from counseling.